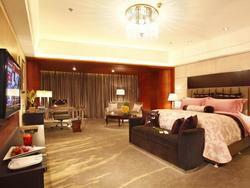 Hangzhou, the capital of Zhejiang Province, is a quite big city and finding quality hotels isn’t always easy. Here you’ll find a selection of the best hotels in town covering a wide range of prices, you only have to choose the most suitable for you. If you want to know more about the best way of booking hotels in China, you can click here to read our tips. The Four Seasons Hotel Hangzhou at West Lake is 4 km from the city center providing easy access to the major attractions of the City. There is Wi-Fi in every room as well as public areas. The front desk is open 24 hours and is happy to arrange tours as well as airport transfers. Room service is also available at all times. Guests can enjoy their private pool and whirlpool bath for relaxation or perhaps stroll in the garden. The fitness center as well as sauna, spa and indoor pool are other features ensuring a comfortable stay. There is a club for kids and business guests have a center and meeting room alternatives. The hotel has a bar, restaurant and BBQ facilities. 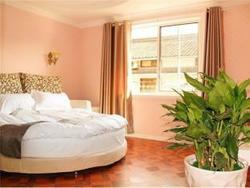 This hotel is one of the most luxurious of the city and you may find it is not orientated towards Western guests. 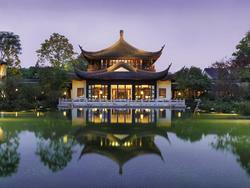 The Wyndham Grand Plaza Royale Hangzhou is situated in West Lake District, a good location for both tourists and businessmen. This is the heart of the City, 45 minutes from the airport. English is just one of several European languages spoken in the hotel whose 24 hour front desk will help with tours and transfers. There is Wi-Fi throughout the hotel which offers a business center and meeting rooms on request. There is a fitness center with indoor pool and sauna, as well as a pool for kids. The bar, coffee shop and restaurant offer refreshments and there are shops on site. Service seems a priority and that is something guaranteeing that guests will return. 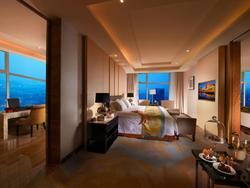 The Hyatt Regency Hangzhou Hotel in West Lake District is at the heart of the action for tourist and businessman alike. Almost 400 rooms offer Wi-Fi as standard, 24 hour room service and the facilities are such that guests can enjoy the hotel when not out exploring or on business. The fitness center, indoor pool, steam room, sauna, spa and massage provide plenty of relaxation alternatives. Kids have a pool while businessmen a center and meeting room facility. The front desk is open 24 hours organising tours and transfers on request. There are bar, coffee shop and restaurant. The hotel is not cheap and perhaps at times does not reach the standards expected. The Grand Parkray Hangzhou Hotel is in Xiaoshan close to the subway station linking it to the city center and with easy access to the commercial and entertainment districts of the city. The 24 hour front desk is happy to help with enquiries, tours and transfers. Guests can enjoy Wi-Fi in their rooms, 24 hour room service and Wi-Fi in all other parts of the hotel including bar, coffee shop and restaurants. Recreational facilities include hot tub, fitness center, sauna, indoor pool and spa, ideal for relaxation after a busy day. Kids are catered for with a pool and a club. Location isn’t ideal but is clearly compensated by its quality of service and excellent prices. 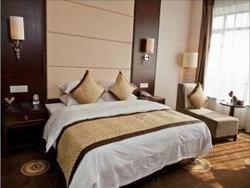 The Huachen International Hotel is near the beautiful West Lake and 30 km from the airport. There are 168 rooms, each with satellite TV, an IDD telephone, and a mini bar. There is local and international cuisine, bars, coffee shop and meeting rooms for businessmen. Luggage storage and a laundry service are further facilities. Wi-Fi is available in public areas and the 24 hour front desk is happy to arrange tours, shuttle and transfers but English is limited. There are plenty of shops and restaurants in the immediate vicinity however. Families and the disabled are well catered for and room service is also 24 hours. A smoking area has been designated. 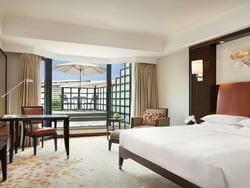 The Victoria Regal Hotel Zhejiang is located near the West Lake, close to the historic Wushan Square. Every room has Wi-Fi which is available throughout the hotel. The 24 hour front desk is happy to organize tours and offer safety deposit and laundry facilities. There is a center for businessmen as well as meeting rooms. Guests can use a fitness center, and have spa, sauna and massage available. 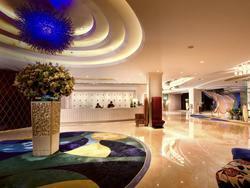 The lobby bar, international and local cuisine and a coffee shop are other guest facilities. The Hotel is suitable for families and the disabled. Room service is on hand 24 hours and smokers have a designated area. The location is the big advantage of this hotel which could do with improvements in some areas. The Ramada Plaza Hangzhou Riverside has easy access to the airport but is not ideally located for the city some 27 km away. That said guests can enjoy several features including Wi-Fi throughout, a fitness center, indoor pool, steam room and massage. The front desk and room service are 24 hours and tours and transfers are easily arranged. Businessmen have a dedicated center and meeting room availability. There are shops, bar, coffee shop and restaurant and disabled guests are well catered for. Additional facilities include a laundry service, safety deposit boxes and family rooms. The hotel meets general approval without getting glowing tributes for any particular aspect. 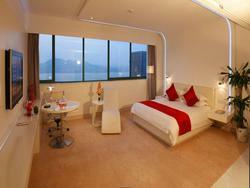 The Hotel Ramada Plaza Hangzhou Xiaoshan is close to Western Lake with easy transport connections to the city center. There are 170 rooms with internet, home entertainment and plenty of recreational facilities within the hotel; health club and pool, restaurants and nightclub and room service during specified hours. There is a business center and English is spoken. A conference center and meeting rooms are other features of the hotel. The hotel is suitable for businessmen and families with a babysitting service available. Tours and transfers can be arranged by the concierge and there are shops on site. Overall the hotel gets a nod of approval from its guests. 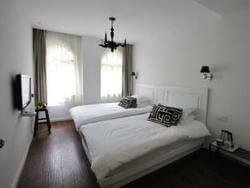 The Lotus International Youth Hostel in Shuguang Road is just a short stroll to West Lake and many local attractions. It has 36 rooms of varying sizes including family accommodation and dormitories. The front desk is open 24 hours. There is a café and bar and the hostel is known for its cleanliness. There is space outside to relax and there are bicycles available for those wanting to explore though they perhaps are in need of a little maintenance. There is free internet but it is not necessarily reliable. Laundry and luggage storage are additional facilities for a hostel that overall receives regular positive comment. 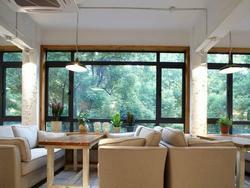 The Hangzhou YMCA International Youth Hostel is close to the bustling commercial center of Hangzhou. 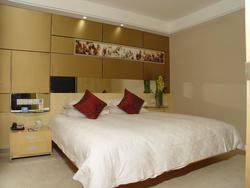 West Lake and many of the city’s attractions are close by and transport links are good. Shops and restaurants are plentiful in the neighborhood. There is Wi-Fi throughout the hostel with a business center, 24 hour room service as well as shops. Staff is happy to help with tours and guests have a coffee shop for refreshments. Luggage storage and laundry facilities are additional features. There is a designated area for smoking. The hostel scores for location and value for money though English is limited and there are some issues about shared facilities. The Maison Hostel Hangzhou lies 7.8 Km from the city center making it a choice for those wanting a rural location yet with decent access to the city center. It is modern and offers free Wi-Fi throughout. Staff is happy to arrange tours and transfers. There is a restaurant and facilities are suitable for families. Smokers have a designated area while room service is available at specified times. In all there are 10 rooms of differing sizes and the hostel scores well on most points; location, staff, value, cleanliness and comfort with only food brought into question though there are inexpensive options close by.